Whatever you’re betting on and however seriously you’re taking it, knowing the nuts and bolts of the sport you’re punting on is essential. A good betting strategy is needed. There are plenty of different horse racing events and betting markets out there to get involved in. So we’ve compiled this guide to betting on racing to help you get your head round it all. Only ever had a small bet on the Grand National? Or took your mate’s advice and had a flutter on the Gold Cup one year but haven’t bet since? Whatever your experience of betting on racing in the past, here’s your chance to really understand what the major racing betting markets are, how they work and to benefit from some valuable horse racing tips. Just like in say football where match odds/winner is the main betting market, betting on which horse will win is by far the most popular bet you can have. Pro punters claim this remains the best route to showing a profit. But it’s not the only one. Each-way betting allows you to be rewarded when your horse runs well but doesn’t actually win. If it’s placed second or third in races of eight or more runners, you’ll be paid out at a fifth of the odds. If it’s in handicap races of 16 runners or more you’ll be paid out each-way, all the way down to fourth place (and in some cases fifth on selected races) at a quarter of the odds. It’s worth remembering that if your horse wins, you’ll get paid out half your stake at the win price and half of it at the each-way price. We’ve all read stories of a recreational punter winning fortunes from a 50p stake thanks to a huge-priced multiple that came in. A multiple by definition, is made up of at least two selections. Theoretically, there’s no limit on how many selections it can have. The downside to this potentially life-changing method of betting is that one just selection not winning ruins your whole multiple. An alternative is using system bets. Unlike multiples, one loser doesn’t ruin the whole thing. Rather, the more of them making up your system bet that you get right, the more you’ll win. Patent– Seven bets on three horses: three singles, two doubles and a treble. Yankee– 11 bets on four horses: Six doubles, four trebles and a four-fold accumulator. Canadian– Five horses backed across 26 betting combinations. Heinz– Six horses backed across 57 combinations. Not one to get involved in until you’ve mastered the basics first. Rather than betting on who will win, you’re betting on who won’t. This is made possible by betting exchanges, where you can play the role of bookmaker in addition to just punter. One to approach with caution because if you lay say a 3/1 shot and it wins, you’ll have to pay out at three times the stake you agreed to accept from a backer. Starting price (SP) are the odds at which a horse goes off at; the last odds offered before the race begins. You can choose to bet at odds available before the off in an attempt to secure bigger prices but these days you get two bites of the cherry most of the time, anyway. That’s because bookies often pay out at SP rather than your odds, if the SP turns out to be bigger. But if the bet is on a ‘non-runner – no bet’ market, you lose your money if the horse doesn’t run at all. Is easier said than done because racing in the UK has so many variables. Our guide to betting on racing explains the most important factors to consider. Just like their golf courses, the UK and Ireland’s racecourses are the most varied of anywhere. The angles and surface of each one make a huge difference. As does the draw- the position from where each horse starts the race. You can research online and find out the characteristics of each one. This relates to the state of the grass the horses run on. Some horses enjoy running on grass that is just right in terms of moisture and perfect for running at speed, known as ‘good’. Other horses can compensate for their lack of speed by running better than faster horses on ground that is ‘soft’ or ‘heavy’, quite simply because they adapt better to those conditions. The shortest distance a flat race in the UK is run over is five furlongs. The longest is two and three-quarter miles. Over the course of the horse’s career, trainers discover what is the ideal distance for each of their horses to run over. Just because one can win over five furlongs doesn’t mean they can win over six. Their stamina, or lack of it, may mean the extra furlong doesn’t suit them. The minimum distance in jumps racing is two miles; the most is four and a half. Some punters find it easier to follow a handful of trainers than 15 or 20 different horses. The best ones, like Paul Nicholls or Nicky Henderson on the jumps, train lots of winners and you can rest assured that their horses will give you a good run for your money. Lots of stats are available online on the performances of their horses, divided by type of race, distance, how often they win and other factors. Backing horses ridden by the champs like Ruby Walsh or Silvestre de Sousa should provide lots of winners but then again, their quality as jockeys is reflected in the shorter odds of the horses they’re on board. Just like with trainers, there are plenty of stats about each one and you can tweak the data to find out what you need. At its most basic level, UK racing is divided into National Hunt Racing (jumps) and Flat Racing. But each of those is further divided into different types. A maiden race is contested by horses who have never won a race before, so they’re normally around the two-year old mark. With little form to go on, it’s not easy picking winners here. But you can use footage of these races to find the stars of tomorrow or at least horses who may win sometime soon. Handicaps are a way of creating something of a level playing field amongst horses of different levels of ability. After each race a horse is given a rating based on their performance, which contributes to their career rating. A horse rated 105 is deemed to be 15lbs superior to one rated 90. So that’s how much weight it would carry compared to the weaker horse in a handicap race. Theoretically it means any horse in the race has a decent chance and helps to explain why betting on handicaps is so popular. These are the cream of racing aimed at finding the best of the best. The highest of all is Group 1, then Group 2 and 3. It’s not unusual for champion horses that are seemingly unbeatable to be heavy odds-on shots but there are also some Group Races where things are much more competitive and several are in with a good chance. Also known as National Hunt Flat Races. These are races for horses with no experience of running on the flat but are run under the rules of Jump racing. They’ve become increasingly popular to bet on with the best known of all being the Champion Bumper, which is part of the prestigious Cheltenham Festival. The downside as a punter is there’s little form to go on so plenty of guesswork involved. The jumps equivalent of maidens. Sort of. In this case horses normally take part if they’ve never won before but they can also take part if they have, albeit carrying a penalty the next time. Again, it’s fraught with danger as a punter because you may know the horse can run but you’ll have little evidence to suggest whether or not they can jump. Horses take part in novices from the age of three. Once again, this works the same as it does in flat racing. The better the horse, the more weight it will carry compared to its rivals. The only difference is the weight that’s applied in relation to the distance covered. Lots of the biggest jump races are handicaps, including the biggest of them all: The Grand National. National Hunt horses compete for much longer than Flat horses so you can get to know them for longer over their careers and get a better idea of when they might come good based on the relevant factors on the day. These are the highest level races in National Hunt that aren’t handicaps. Amongst them are the Cheltenham Gold Cup and the Champion Hurdle (Cheltenham), with others being run in Liverpool and Punchestown. They’re run over several distances and the trainers will target wins in these for their very best horses. The St Leger, the Oaks, the Derby, the 1000 Guineas and the 2000 Guineas make up the five Classic races in English flat racing. Fillies run in the 1000 Guineas at Newmarket (over a mile) and the Epsom Oaks (a mile and a half). For colts, it’s the 2000 Guineas (also Newmarket) and the Derby (Epsom). Strictly speaking, fillies can run in the Derby but you don’t often see it. At the St Leger at Doncaster, run over a mile and three quarters, you get entries from both sexes. When you lump the 2000 Guineas, the Derby and the St Leger together, you get the Triple Crown. Back in 1970 the great Nijinsky won all three, the last horse to do so. But in 2012 the feat came close to being repeated with Camelot, trained by Aiden O’Brien, winning the first two legs but finishing as runner-up in the third. Ireland has its own equivalent of the Triple Crown made up of the same five Classic races. Each June the best flat horses come together at Royal Ascot, the biggest meeting of the year. Of the 30 races that are contested across five days, nineteen of them are Group Races. There’s £7million up for grabs across the whole festival with some of the most high-profile races including: The Queen Anne Stakes, The Prince of Wales’ Stakes and the Ascot Gold Cup. Glorious Goodwood and the Newmarket July Festival are other high-profile Flat racing Festival Meetings where the best British and Irish horses are joined by those from continental Europe, the US, Japan and beyond. They say all roads lead to Cheltenham in National Hunt racing. That’s because it’s the most important festival of the year. For horses who run over three and a quarter miles, there’s no bigger prize than the Cheltenham Gold Cup. If it’s two miles they run, then it’s the Champion Hurdle they all want their horse to win. Other Cheltenham highlights are: The Stayers Hurdle, The Ryanair Chase and the Queen Mother Champion Chase. But none of those are the most famous race of them all. That honour falls to The Grand National, a steeplechase ran every April at the Aintree racecourse. It’s the hardest race in the world and contested over four and a quarter miles with huge fences that challenge each and every horse for the entire distance. The Irish Grand National, Scottish Grand National and Welsh National are other staying chases that are as prestigious as they are rewarding to the horse’s owners. The Godolpin Arabian, the Byerly Turk and the Darley Arabian. These names may not mean anything to most of us but they were the three stallions first brought to England and bred to English and European bloodlines to create the first generation of thoroughbreds. All today’s thoroughbreds started with them. Racing in the UK is known as the ‘Sport of Kings’ because it quickly became a favourite pastime of the Royals and Aristocracy. The rules governing it were created in the 17th Century with the Newmarket Town Plate first contested in 1666. Somewhat surprisingly, the first of the five Classic races to be held was the St Leger, way back in 1776. The Derby Stakes took place four years later. You can see the influence of UK races elsewhere, with just one example being the Kentucky Derby, which borrowed the name from the English Classic race. Interestingly, the Cheltenham Gold Cup started off as flat race, only becoming a steeplechase in 1924. 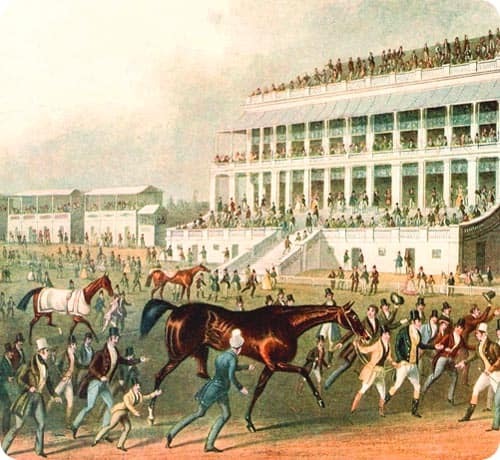 The Grand National was first run in 1839. So all in all, you can see there’s plenty of history in UK racing once you start looking. So that’s our racing betting guide done and we hope you enjoyed it. Hopefully, you’re now up to date on all the basics and ready to start making some money from it. The one thing we haven’t yet mentioned which is absolutely crucial is that you keep a record of all your bets. By doing so, you’re far better equipped to know your strengths and weaknesses in terms of your racing betting and where you have a better success rate. You can also manage your bankroll better which is a key contributor to showing a profit in the long run, which is what this is all about. No-one can know every horse who runs in the UK and keep track of their performances. But then again: you don’t need to. Specialise in the races that have brought you success in the past and don’t bother with those that haven’t. No-one said you needed to be a racing all-rounder. The more you specialise, the more likely you are to be successful. Keep stakes sensible and enjoy this wonderful sport while trying to make some money from it.